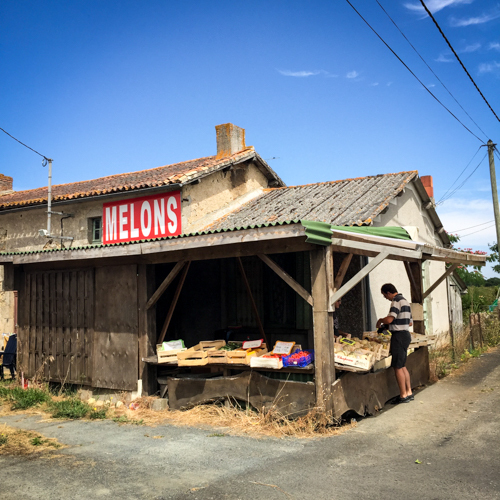 I’ve recently completed a 1000mile bike tour through France and Spain and wanted to share a little bit about the food I ate along the way. 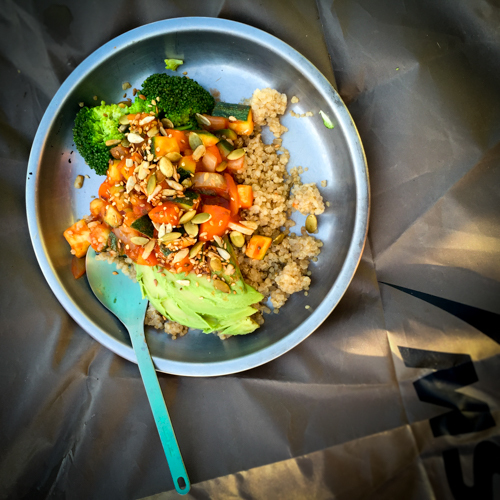 I tried to eat well, choosing foods that would energise my journey rather than drag me down. 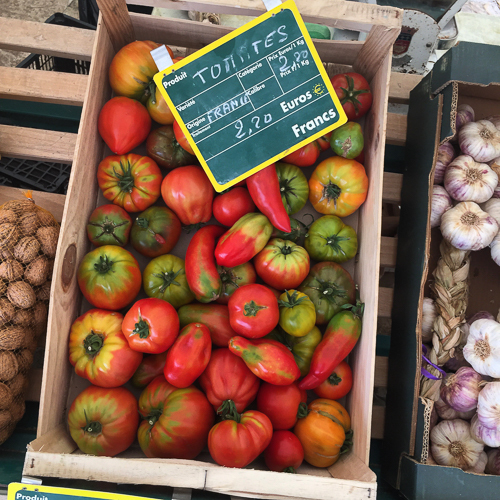 This is pretty easy to do in France and Spain, where there are fresh local delights to experience along the way, especially at the various markets, green grocers and artisan shops in the towns and villages. I was spoilt for choice, really. Every day I anticipated what I would find in each village I came too. If I was lucky, I’d hit a village on market day, where it was always difficult to restrain myself from buying EVERYTHING. 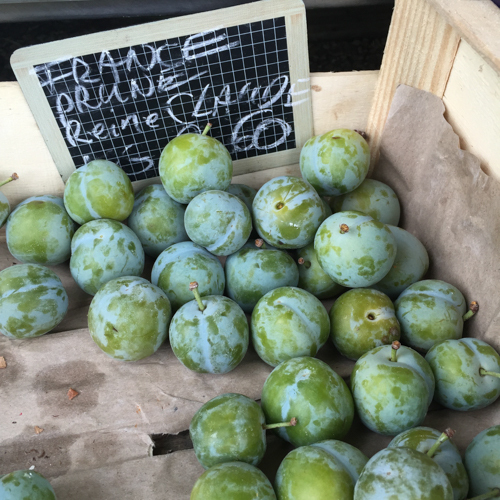 Highlights included: fresh tomatoes, cantaloupe, stone fruit (especially greengages) and haricot vert (aka green beans). Bike-friendly food is compact and difficult to bruise. 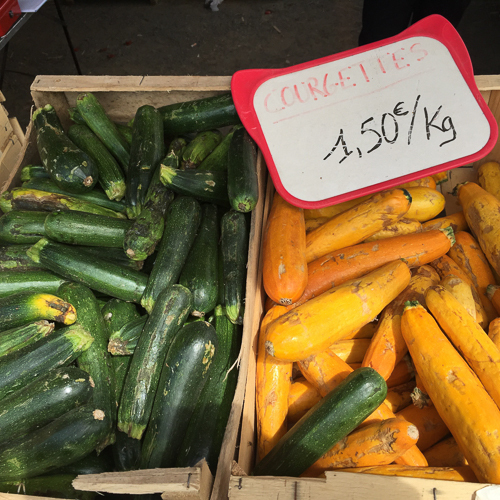 Courgettes, carrots and onions were a daily purchase, interspersed with aubergine, broccoli (not compact but I love it) and green beans. 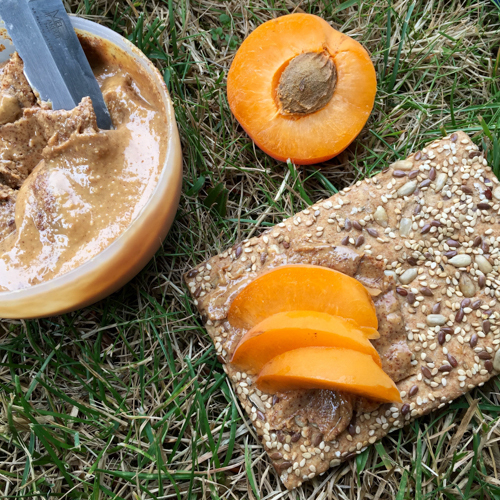 When it comes to fruit, apricots and plums were less prone to being smushed than nectarines and peaches. Tomatoes, bananas and avocados are also fairly delicate but I always bought them anyway because they’re so good! 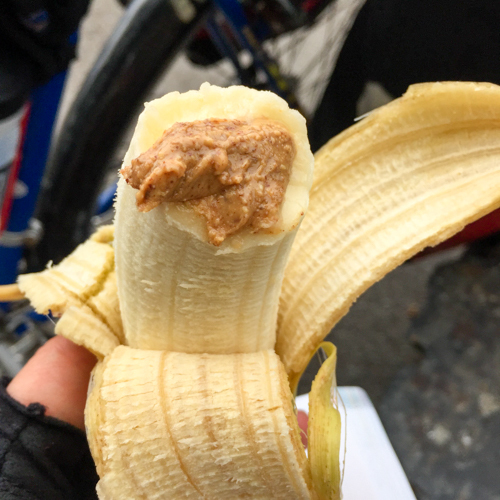 When you’re riding a bicycle for 50+ miles a day in hilly conditions, you need lots of calories, and almond butter was my ultimate calorie delivery device. This was a late morning and often afternoon snack ritual, especially when I felt my energy dragging. Almond butter plus banana seemed to have a magical effect of totally recharging me. Nuts! 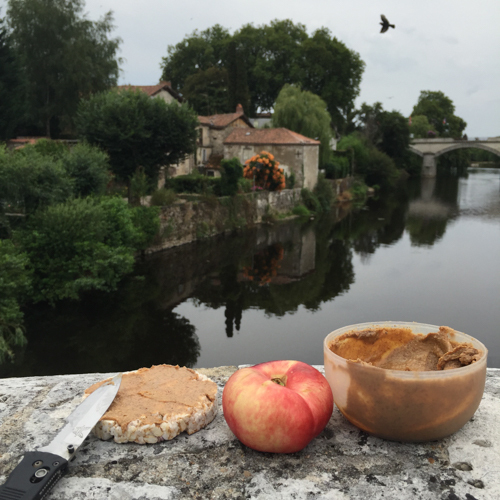 Especially if your cycling in the Dordogne along the Route de la noix, noix meaning walnuts! 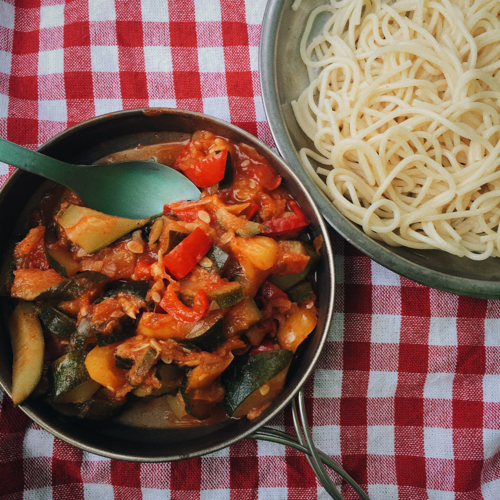 Sauteed veg was a regular dinner at the campsite, which I’d mix up with herbs and spices (old film canisters make excellent travel vessels for spices). Just add chickpeas and / or some kind of grain (pasta, quinoa, bulgar wheat) to make the meal complete. (For the record, I use an MSR Pocket Rocket for my cooking needs, and yes you CAN get fuel for it in France and Spain). 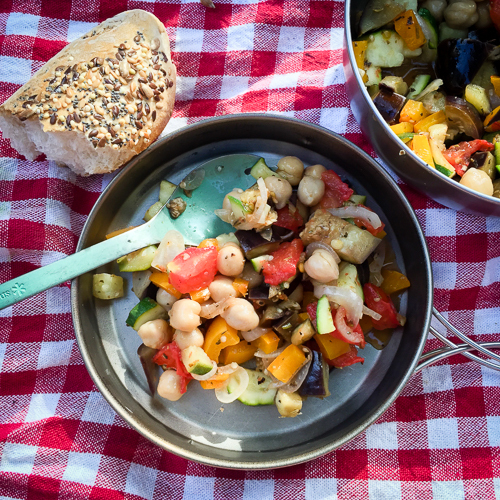 This is in the sautéed vegetable arena but it’s worth a mention on its own because it’s just so awesome and totally doable on a camp stove. Add chickpeas for more protein. I came to prefer this for breakfast because it saved on fuel and was also less hot and stodgy for the hot summer weather. I especially loved it with plums and flat peaches. 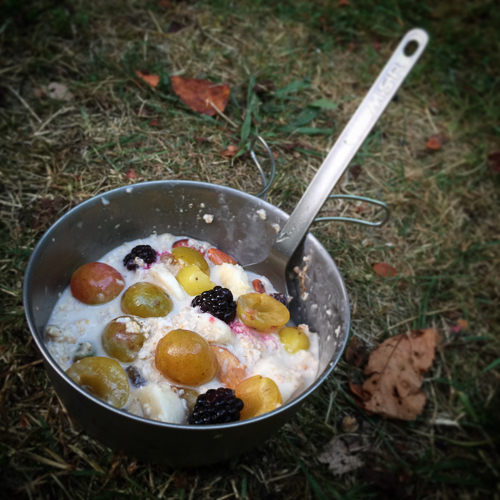 See my recipe for Bircher Muesli for how it’s done. As I already mentioned, I liked to augment my sautéed veg with grains. Quinoa and bulgar wheat are my preferred choice because they are quick to cook and really good for you. 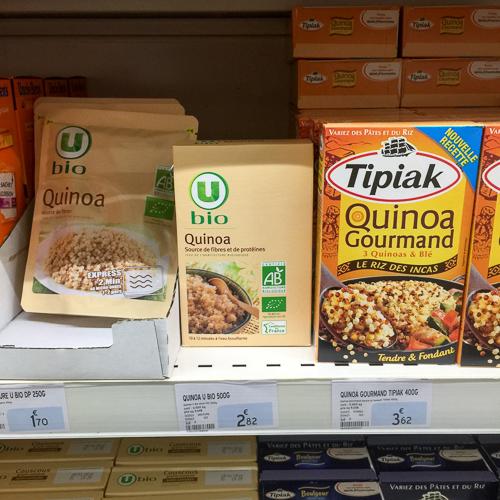 You can even save a step by buying pre-cooked quinoa packets which I found at many of the larger super markets. My one exception to my almost total veganism throughout the trip. 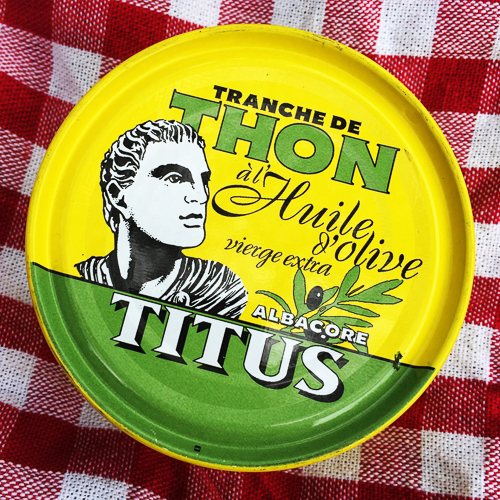 The tinned tuna available in France and Spain is in a whole class of its own, and the branding is irresistible (I’m a sucker I know). A favourite lunch was sliced tomato with avocado and tinned tuna. Perfect in its simplicity. I was so glad I took a few minutes to toast up some mixed seeds to take with me (pumpkin, sunflower, sesame and flax). They’re a quick way to add crunch, flavour and slow-burning calories to just about any meal. 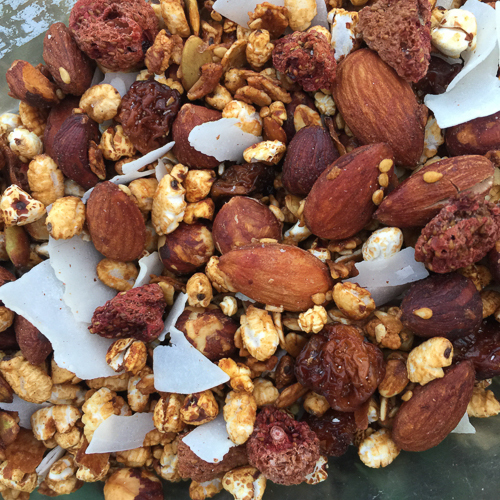 You could up the ante with dukkah if you want to get super fancy. My go-to recipe is Ottolenghi’s dukkah. 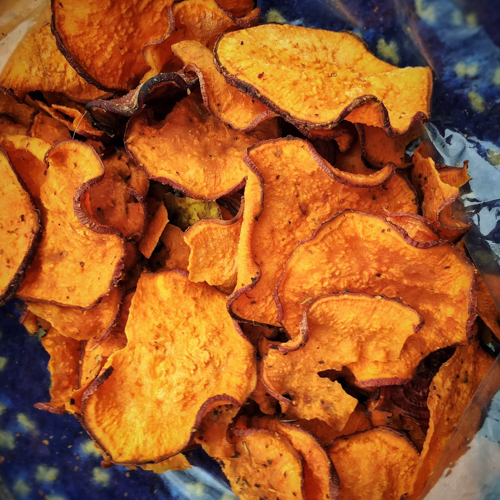 I made a batch of these raw vegetable crisps in my dehydrator before I left. Sweet potato and beetroot are my favourites. These didn’t last long. I also made a batch of granola before I left. 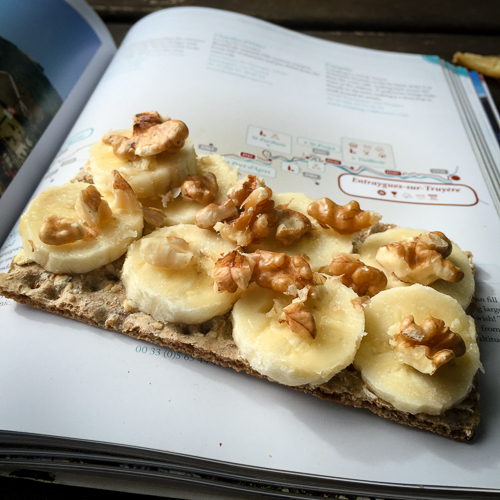 A tasty eat-from-the-bag snack and also a great garnish for porridge (yep, double oats – it’s gonna be a long ride!). Recipe via Bon Appetit. All along the way you will come across specialty produce in jars and cans, everything from beans to peppers to mushrooms to meat and fish. 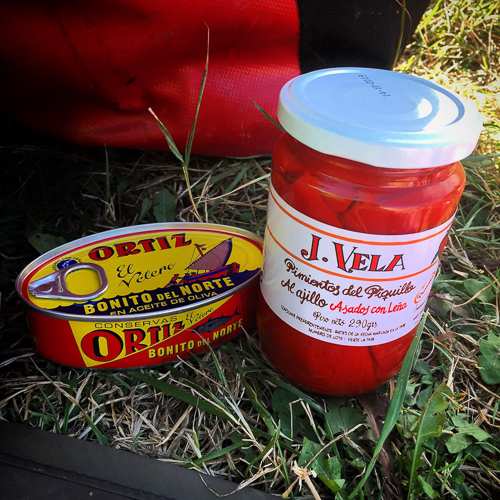 Obviously when you’re travelling with bicycle panniers there are certain space and weight limitations, but it’s worth picking up a jar or two of tasty looking things as you go and giving stuff a try! After all, this isn’t just about cranking through the miles – it’s about experiencing the terroir as you go! I should also add that on the bike I also carried with me the bare essentials for bringing everything together: olive oil, salt and pepper, a few garlic cloves, and old film canisters filled with spices (herbs de provence saw the most use). 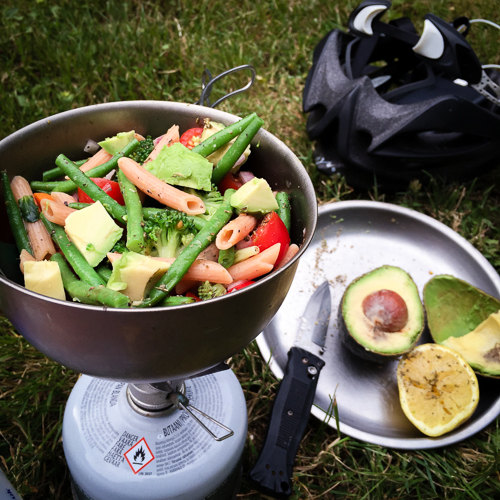 Plus the rest of my camp kitchen kit you can find in my Bike Tour Packing List.  Any other top food tips for bicycle tourists and minimalist campers? (Not that travelling with avocado and baguettes is actually minimal.) 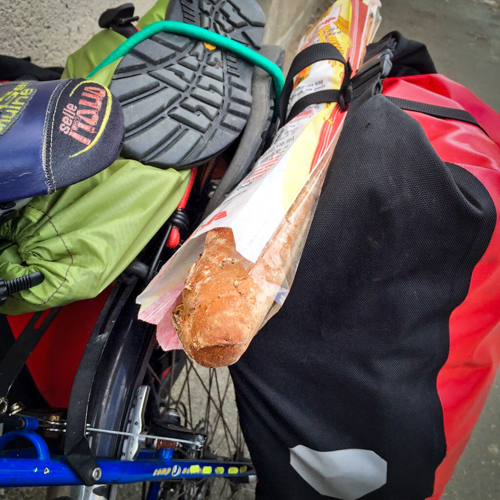 What would you add to your bike tour pantry?